daisymaisy Apr 15 2019 3:23 am I just saw his movie "The dude in me" and He was such a great actor! ynari Mar 23 2019 1:25 am I really want to see him as a lead role in drama, he's so perfect !! dramawatcher Mar 22 2019 5:03 pm Still waiting on the day this Jinyoung gets a lead drama role especially after seeing his movie lead role from The Dude in Me. Nour El Mar 15 2019 2:48 pm Oppa saranghae. since watch you in the Dude in me i'm falling in love with you. Rin Mar 11 2019 7:45 pm Just watch your movie the dude in me.. Love it so much..? i think i'm just fall in love withh you..
Shanta Nov 04 2018 4:11 pm You will always be in my list of precious actors, thanks for making my teen life more precious, I used to have your photos on my mobile which wasn't smart phone. 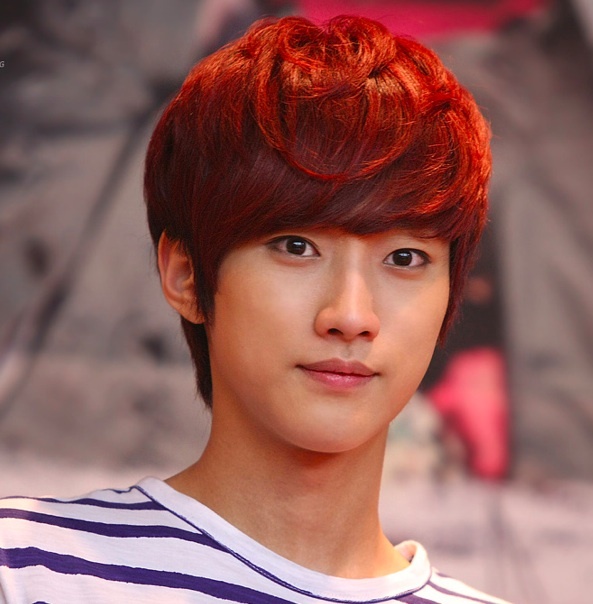 Its sad that you left b1a4, but I love you and support you in what you do. Please make come back soon! Far Z May 18 2018 3:21 pm I saw him for the first time in Love in the Moonlight and fell in love with his character.After stalking him,I came to know he belonged to a band B1a4 and the music being produced by these guys is just awesome but idky they don't get the recognition in Korea which they deserve.Anyways,Best of luck for your upcoming projects.Desperately waiting for your movie!? Lots of love & prayers from Pakistan!?? babyboo Jan 07 2018 7:24 am He has an upcoming movie for this year.. really looking forward to it!! Becky Oct 28 2017 2:20 pm I love this story and the actors well done.I cried at the end.Their was so much left unsaid .I would love to see these two in a drama .series. ErikaJung Aug 24 2017 4:47 am Hi!! Halbae I hope i see u someday or i hope be guest on Gandang gabi Vice.. I hope my wish is be true someday i wait Oppa Saranghae B1a4 Saranghae..
Shanta Aug 10 2017 10:37 am Oppa, please act in more dramas. I will always support you because you made my teenage life more meaningful! Now I'm no longer a teen though. Patricia Monique Borinaga May 10 2017 7:08 am Hi. I love music so Please continue making more and more. We'll looking forward for your success. Always carry your passion by heart and strive hard to reach your goal. We'll be rooting for you. Fighting!! -All love and support from PHILIPPINES ❤ Frm one of your fans -Monica? jaesiege Apr 16 2017 8:12 am Jin Young ♡ was a fan of B1A4 already even before watching LITM. Although my bias is CNU, you're slowly creeping into my heart. I can't get you off my mind! You're such a bias wrecker. I'm not saying it's bad though ? eline christina Apr 04 2017 7:15 pm daebak acting skill. amazing voice. and he's hella good at composing. talk about perfect, eh? Lulu Jan 18 2017 6:54 am I fell in love with you the first time I saw you in Love in the Moonlight drama. And now, you'll be having a concert in our country wohooo! One korea yey! ?? see you! LEANA Jan 04 2017 7:53 am jin young! Oppa. i first saw you in the love in the moonlight. you captured my heart.??? please give him more projects. a main ro le will suit him best! he's so charming ??? more power to you. lovelove. hope to see u in person. ? Mango Dec 06 2016 4:27 am Jin young is legit perfect he is a pretty boy, a good songwriter, a good actor, a good singer and hes the kindest person ever. But hes so underrated and never the main lead. Pls let jinyoung be a main for once!! Nikki Nov 13 2016 3:49 am Please give him to be the main actor in future! He is a great actor! Please give him more chances! Charming and talented! divine27 Nov 08 2016 9:13 pm Pls.main role for you. You and Kim You-Jung. Next drama for them. They have a good chemistry..
majimak Nov 01 2016 2:27 am he's a really good actor and musician.. how could one person be this talented...? and really handsome.. looking forward to his next project.. will always support him..
Charish Kaye Frias Oct 27 2016 7:04 am Your face is so calm, jinyoung. It's too handsome on screen. I met you in the drama series of Love in the Moonlight and you had played a great character there huhuhu you truly showed how great your love is for Ra On. Wishing you long life and good health. Fighting idol Jinyoung!! Saranghaeyo! Nicole Oct 21 2016 10:57 am His something..
K lover Oct 19 2016 12:17 pm Omo!! So thats why he's so familiar. Ive watched miss granny, I didnt recognize him in love in the moonlight. I love his character and his face looks very innocent and lovable. Aradia Oct 12 2016 8:48 am I think I've caught the 2nd lead syndrome bug (which I seldom do). I love Jin Young's cunning, resourceful and cool character in Love in the Moonlight drama. Hope to see more of his acting in the future as a main lead in a drama. I'll definitely watch it if that happens! All the best Jin Young! Christina Oct 12 2016 3:14 am When I saw Jin Young sshi in LITML , I did not recognise him but just simply love his character and the way he carried it. I just cannot help it but wish YoonSung will be happy. Hope to see you as male lead soon. elizabeth Sep 22 2016 2:30 am Another good looking & talented actor.... took notice of you when you were in Persevere, Goo Hae-ra.... Love you more in Love in the moonlight... Keep up the good work!!! Sylvia Sep 21 2016 10:26 pm Another young handsome fine actor. L.I.T.Moonlight did an excellent job in their selection of cast. Wish u the best. Roh Laren Sep 11 2016 10:02 am He certainly is pretty. The character he plays in Love in the Moonlight is equally as pretty in his costumes. Such elaborate clothing really enhances his beauty and adds an allure that other wise, may not be there. It helps he's a good actor...so young and handsome! Yeah, I like this kid. Leii Sep 03 2016 1:57 am Jinyoung, the leader grandpa who can compose and produce songs while promoting and acting.. i love miss granny and she is wow so much!! Park Min Rin Sep 03 2016 12:32 am i'm a fan of Jin young n love in the moonlight but i don't know that he was the actor ....i just realized now..
Melissa Aug 28 2016 6:53 am You're so cool in Moonlight!! keep it up I hope you can get more recognition as actor!! precious May 26 2016 2:29 pm Watched him in warm and cozy , I pray that hr performs well in mldbc ,so that he would become a superb actor. Person Dec 07 2015 12:53 am I can't speak... He SOOO HANDSOME!!! And I always get jin woon from 2pm mix up with him.... I think I am the only person who thinks this.... ANYWAYS! Oppa please be in more dramas! Jenna Oct 11 2015 11:21 am Jin young oppa, you're voice is so attractive and it is so beautiful.wish you! echa Jun 26 2015 9:41 am I really love his acting in Persevere Goo Hae Ra ! Very touching ! Himonny Jun 24 2015 10:01 pm He is so handsome and so SO so cute. Jane Apr 19 2015 4:10 am He's cute on She Is WOW. i adore him so much! TDEK Mar 25 2015 10:14 pm He looks like Lee Joon(former MBLAQ member and now actor) to me. I've always thought they could pass off as brothers. lol. Anyway's he's one of the few idol-actors out there who has got great potential. I'm a B1A4 fan from the start but became a great fan of his acting since She Is Wow. He was excellent in it. & to think that was his first major acting project, that is quite incredible. Looking forward to more of works in his growing acting resume. Kimchiinitaly Feb 17 2015 10:08 am I don't know nothing about b1A4 except for the song Lonely that I have in my computer but I'm totally loving Jin Young's voice in Perseverance, Goo Hae Ra. Even my mom is watching the drama because of his voice. Loving the drama, please continue to amaze people. Fighting! aprilyn May 25 2014 7:39 am OMG! J.Y your so great... Even though your role in She's wow is badboy. I think your the only one 4 me who can be both CUTIE BadBoY.